A heavy duty chemical blend for deep cleaning of central heating systems. Removes corrosion debris and lime scale deposits. Stops kettling caused by scale build-up and removes cold zones. Can be used with power flushing machine. Suitable for use with all metals and alloys including aluminium. Can be used on multi-metal systems. Totally safe product – non-toxic and non-hazardous. Filling the system: Open systems should be dosed via the filling and expansion tank. Sealed systems i.e. combi should be filled via the filling loop or a partially drained radiator. Once system is dosed circulate the liquid through the system at normal operating temperature with all valves open and pump turned to maximum speed for at least one hour or until satisfactory performance is achieved - maximum time 4 weeks (if aluminium parts are involved - maximum 3 hours). Once the system is performing satisfactorily turn off the boiler and drain down the system. Flush through until water runs clear. On re-filling the system use PC100 or 200 Inhibitor. Dosage: For optimum cleaning the system should be dosed @ 1% of system i.e. 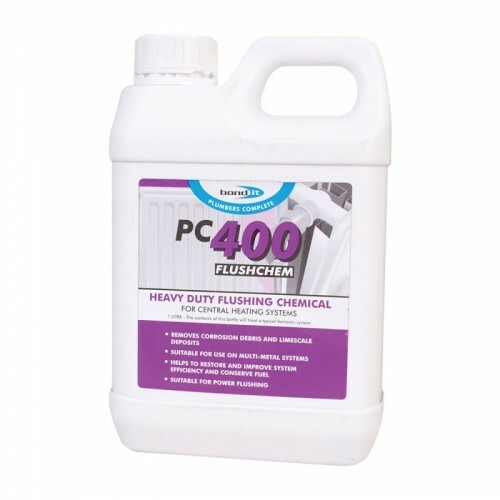 1L of PC400 to 100L of water in system. Generally 1L is sufficient for a typical system with a 14.5Kw Boiler (50,000 Btu/hr). A badly contaminated system, larger than this will need 2% solution or dosing pro rata.